Since Windows 7 was released, the limitations of its restoration have caught people’s much attention. Not only its users talk about the shortcomings, but also Windows 7 itself confesses that it is not perfect. This essay will give a comparatively complete list of Windows7 restore defects. Similar to Windows7 backup, the defects of Windows7 restore is also a hot topic. As is the same, a list of the weak points is made combining the ideas both of Windws7 itself and the users. If the files or programs you are going to restore are in use, you will not succeed. Therefore, before you start System Restore, save any open files and close all programs. Once you confirm your restore point, System Restore will restart your computer. If your machine shuts down improperly while a restore point is being created, you may not be able to access that restore point. Likewise, making changes to a system file on a dual-boot machine can corrupt the restore point. When restore previous versions (copies of files and folders that Windows automatically saves with restore points) of a file and folder, the file or folder will replace the current version on your computer, and the replacement cannot be undone. If you accidentally delete or rename a file or folder, you can restore a previous version of that file or folder, but you need to know the location where the file or folder was saved. Turning off system protection for a disk deletes all restore points for that disk. You cannot restore the disk using restore points until you turn system protection on again and a new restore point is created. Turning off system protection also deletes any previous versions of files that were saved for that disk. However, system protection is automatically on for the drive that Windows is installed on. Besides, system protection can only be turned on for drives that are formatted using the NTFS file system. If you use System Restore when the computer is in Safe Mode or using the System Recovery Options, you cannot undo the restore operation. When you turn off System Restore, all existing restore points are lost. At this moment, you can only run System Restore again and choose a different restore point, if one exists. (1)	Use a system image you created earlier to recover your computer. II. Return your computer to the factory setting. This option deletes everything on your computer, including all of your files and any programs you’ve installed, and replaces it with a recovery image provided by your computer manufacturer. Note:Returning Windows to original settings doesn’t completely delete everything on your computer. It deletes programs, but saves user files to the Windows old folder on your hard disk, which you can browse to after the reinstall completes. However, you should still back up any user files before using this method. For example, if you have encrypted files, you might not be able to access them after installing Windows. If you’ve backed up your user files and then restored them after reinstalling Windows, you can delete the Windows old folder. Both methods can result in loss of data. Before beginning either method, you’ll be prompted to back up your personal files to an external location, such as a USB hard disk. After the recovery completes, you can reinstall your programs using the original installation discs or files, and restore your personal files. Since Windows7 backup is not recommended, likely, Windows7 restore is also off advice. 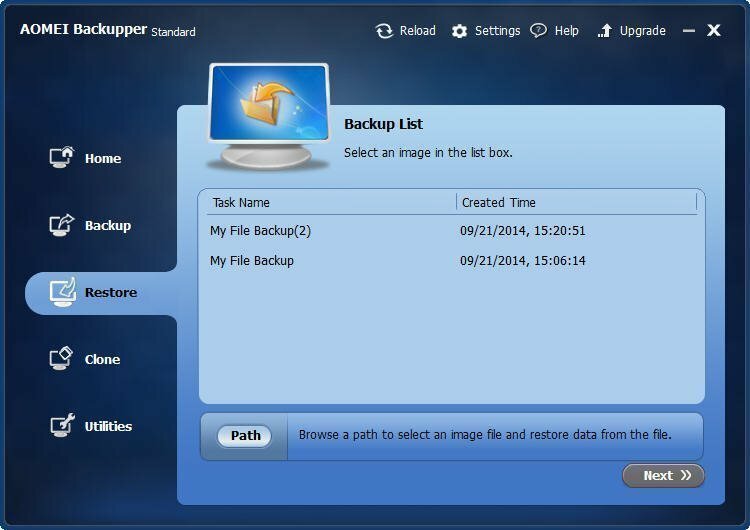 Though all third party backup services contain restore function, AOMEI Backupper is recommended for its intuitive interface and easy operations.